Ahhhhhhh! I’m so excited to finally be writing this post! It’s been a long time coming. Recall for a moment my granny’s dining table that she so generously passed down to me. The yellow is… charming. But not the look we’re going for in our home. And the top surface was in pretty bad shape. Scratches up the wazoo. The finish was so old and deteriorated that it sanded off pretty easily, so I didn’t have to strip! I went at it with my orbital sander until the finish was completely gone and I was left with raw wood. Then I finished it off with 220 sand paper to make it suuuuuper smooth. We taped/papered off the top surface and lightly sanded everything else with 120 grit sandpaper. When preparing to paint, it’s important to rough up the surface so the prime/paint has something to grip onto. Especially if the previous coat of paint has any glossy qualities to it. We used Rustoleum Primer using our paint gun. It only took one coat! I kinda loved it simply being white! But that wasn’t my vision. 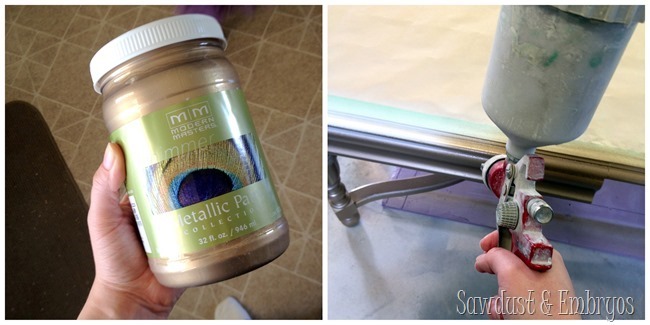 We reached out to the folks at Modern Masters, because we’ve heard wonderful things about their metallic paints. I really wanted to try their ‘Warm Silver’ …which translates to a muted gold/copper on my opinion. They were excited about our project, and generous enough to send us some of their fabulous paint to try out! It’s such a smooth creamy texture, with great coverage. 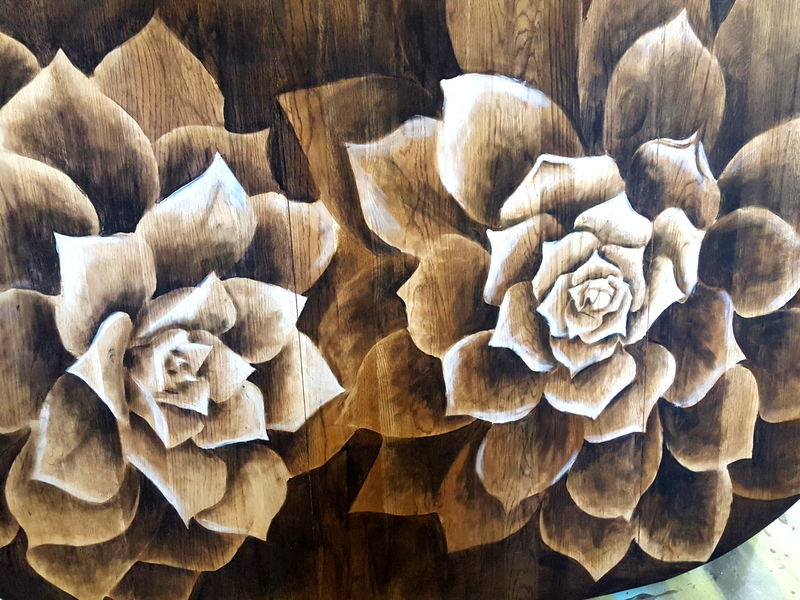 Our staining technique has been one of our most popular posts of all time, and we’re suuuuuper proud of the fact that we sort of ‘invented’ the idea of using wood stain as a medium for artwork and shading. 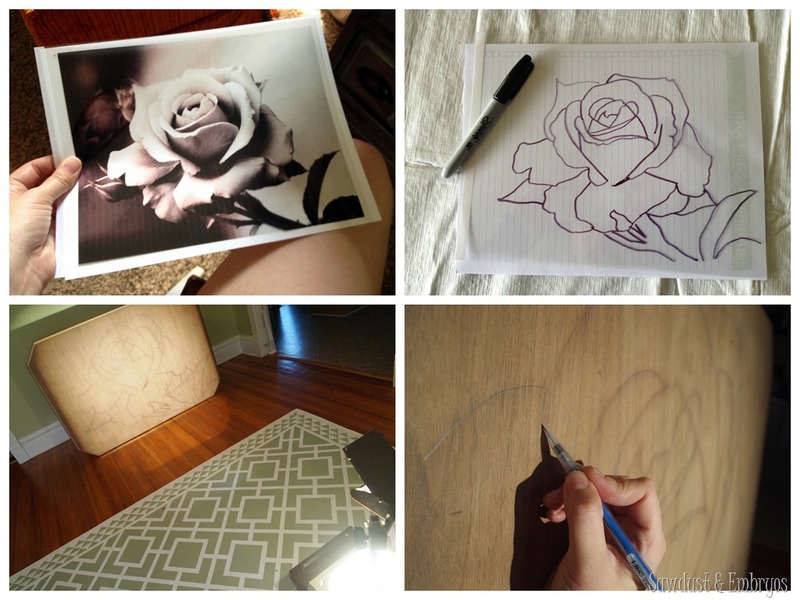 I started by finding an image of a rose that I liked, traced it onto a transparency with a sharpie, projected it onto the table top with an overhead projector, and traced with a pencil. (Talk about a run-on sentence!) As cliché as they are, I love roses… but after this mornings’ post, I’m thinking I should have done a dandelion! 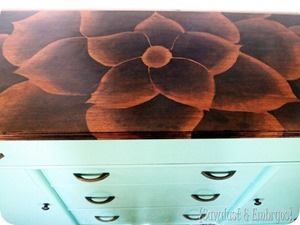 I used JUST ONE SHADE OF STAIN on this one (RustOleum Dark Walnut) and I love the organic and beautiful feel it gives. Let’s just say it’s my favorite furniture transformation OF ALL TIME. And it’s sentimental, being an heirloom… so double whammy y’all. 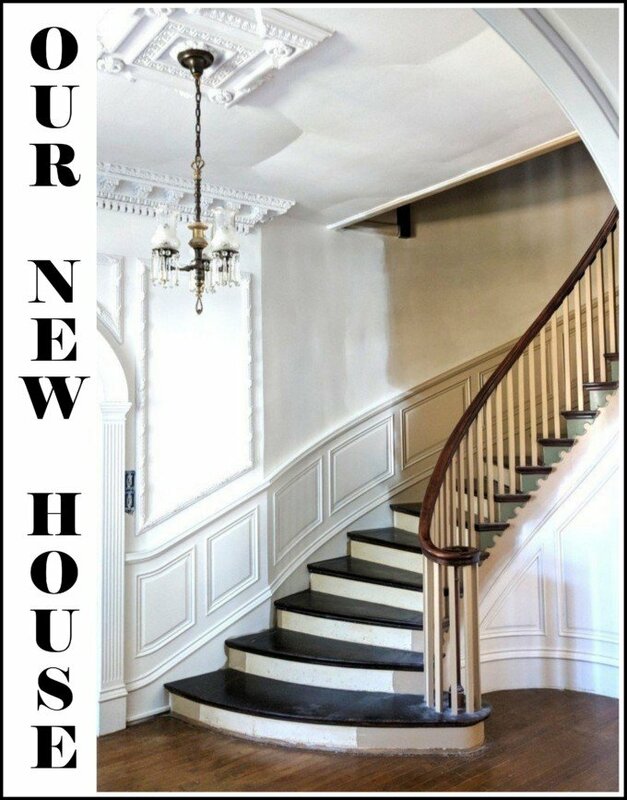 We video taped the actual staining process for you to watch for yourself! If you are intrigued by this technique, but not feeling confident enough to give it a try for yourself, be sure to check out my Beginner’s Tutorial, and/or watch the step-by-step demonstration in the video below! And be sure to check out the other projects we’ve done using this technique! 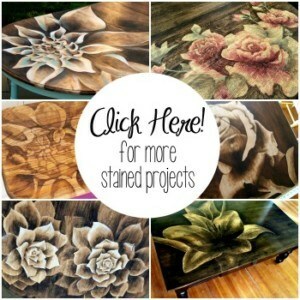 My newest ‘Shading with Stain’ Table! Wood Veneer Lampshade with Stained Art! 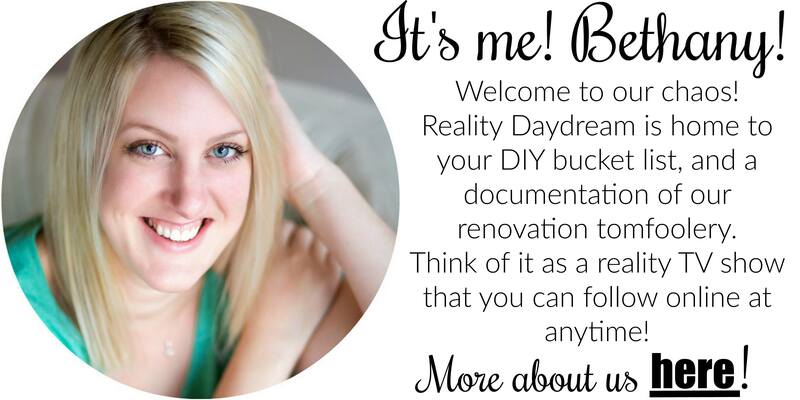 Bethany Sy is the creative free-spirit behind DIY/Lifestyle blog, Reality Daydream. She and her husband have been making their 117-year-old homestead their own, and love sharing tips and tutorials along the way. When they found themselves in the trenches of infertility, they started a journey that would prove to be their most important DIY project ever, and have 3 beautiful girls to show for it. WOW! 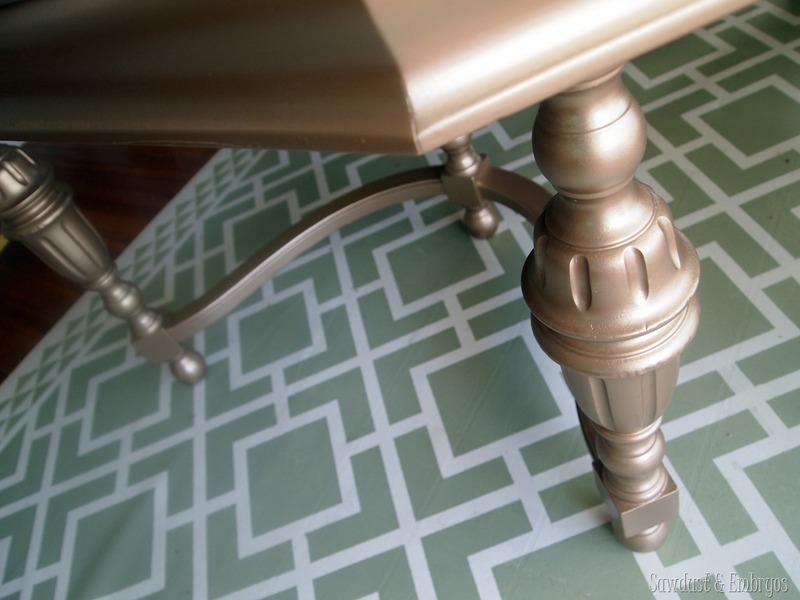 I’m SO inspired to tackle a nesting table set. Thank you…your tutorials are very detailed and easy to follow! Beautiful work. Simplesmente maravilhoso o seu trabalho e a sua boa vontade de compartilhar. Parabéns. Fiquei seu fã. Abraço, Neto. Amazing!!!! But the video of your process is NOT the big giant rose, it is the colored roses. 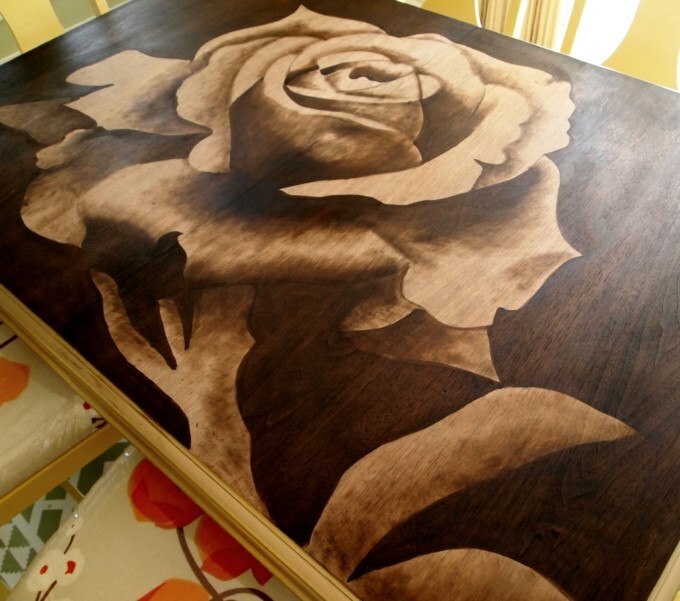 I would love to see the video of the full rose on your heirloom table. The pics and the pinned example show the big rose, but not the actual video. Can we see that somewhere? Thanks you so so much! Can I ask where you got your rose image? I really like it but I can’t find one like it. I love this technique of shading you have come up with. After perfecting the shading skill from your tutorial I plan on stripping my mother’s tea cart and putting to use what I’ve learned from you. I have a few questions though. First, my tea cart has two side extensions each about a foot in width and the center top is only about 24″L X 18″W. Have you ever worked on pieces that have drop-sides like mine? If so, since the sides are normally folded down, how would you advise me in working in the design along the seams? 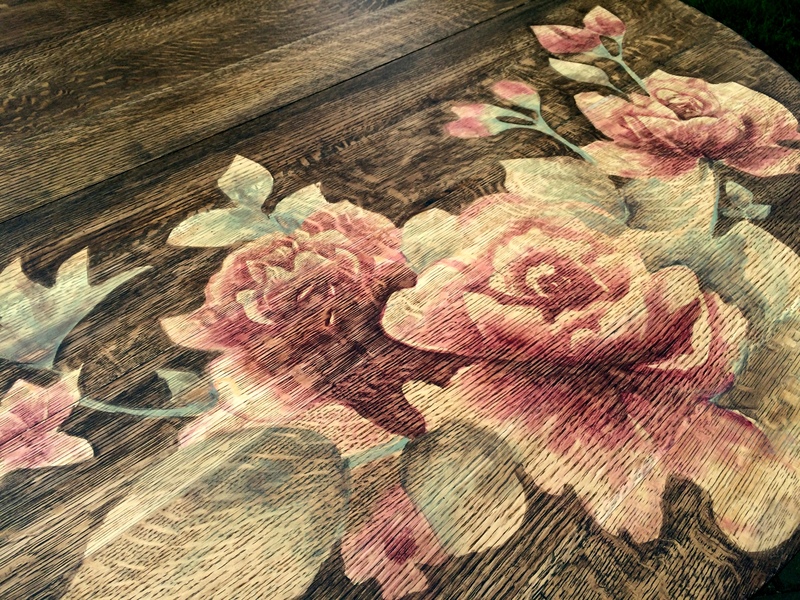 After creating my masterpiece, I prefer the table to have a soft satin finish instead of using a glossy polyurethane. Is there a specific product you have used in the past, similar to what I’d like my results to be, that you prefer over other product finishes that you could recommend? I read that you prefer to keep you location obscure, only stating you’re in Iowa; however, I wondered if you have ever been requested to finish a personal piece for a customer? Do you use any wood conditioner before staining? I would love to know this too! Hi Bethany, I recently was introduced to your shading with stain technique from a friend and thought “No Way can I do that” with the extent of my drawing skills being stick figures but I gave it a shot with another first time project building a bench. Here is the finished project. Yay! You MUST email me a photo! I wish there was a way you could add attachments here in the comment section. Our email is sawdustandembryos@gmail.com. Can’t wait to seeeee!! Yay you should do it! Email us pics when you’re done!! Thanks Darca! You SHOULD! And email us pics when you’re done! Wow, that is absolutely stunning! Thanks Shawna! You’re super sweet! I just stumbled across your blog on pinterest and I actually do similar work with stain, through a different technique. I’ve done a couple of coffee tables, I have a wooden toy chest that I’m currently working on, and a round dining room table that i have only sanded down so far…got ahead of myself starting another project before finishing the first. 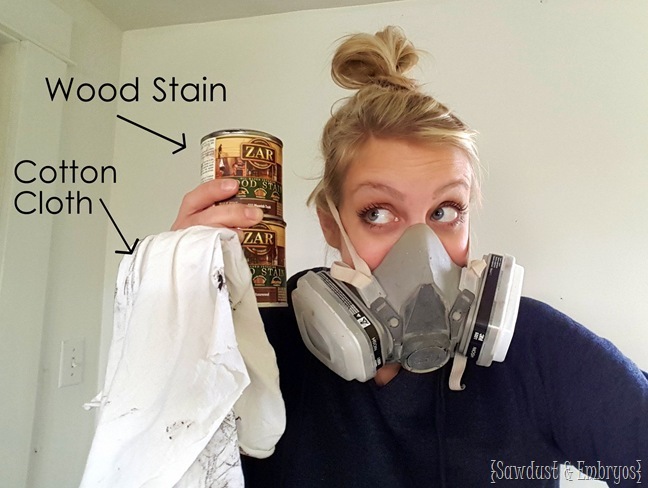 I have never met anyone else who works with stain as a medium and you do gorgeous work. Fantastic idea and tutorial! Thanks so much for sharing and yes, love Rustoleum products! 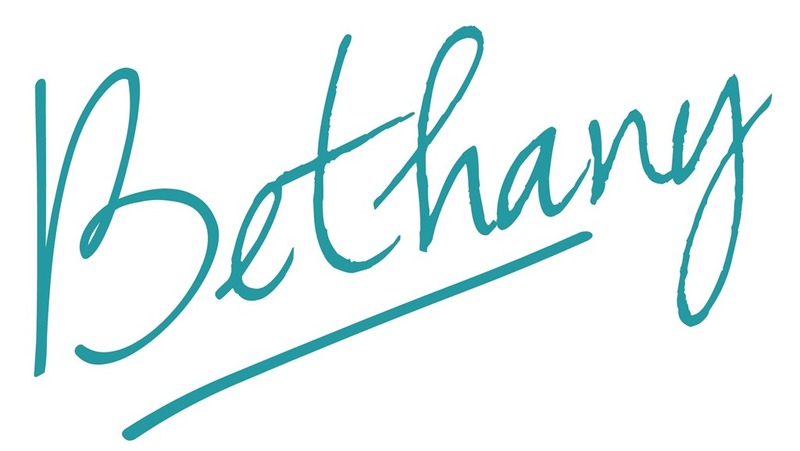 Beth, you are SUPER talented and I look forward to reading your posts! I would love an original piece of artwork from you!! Oh, wow! I can’t wait to try this for myself! I absolutely love this technique. I have no artistic ability so I have enlisted my very talented BFF who is an excellent artist to do a piece for me. We shall see. LOL. Thanks for the ideas and wonderful blog that keeps me inspired. I am a HUGH FAN!! I’ve been waiting for you to do this tutorial. Your work is outstanding!! I am a ceramic artist and I am definately gonna give this a try! I love the table and the technique. Thank you for sharing. I am seriously thinking about painting my backsplash too! Wow, looks Great! I tried to do a coffee table with an owl on it but it didn’t take. I couldn’t get the shading to take. I am going to try again with different wood. Your talent is off the charts! And the video you made is SOO good. Wowza. The table is just so so beautiful. Love this technique,so glad that you showed us how to do it.I have a question,if you decide that a certain area is to dark can it be lightened up by using some lacquer thinner? Love it! Beautiful 🙂 I would hang the picture in my twins’ room…due later this year! Holy CRAP!!!!!! That table is phenominal! I am completely blown away. So beautiful! I love all your projects. Oh my goodness! I am so excited for this video! I have loved all your shading with stain projects, but when I tried it just turned out awful! Thank you so much! So beautiful, Beth! Thank you so much for the video tutorial! I just might have to do another piece like this! The Rose is GORGE!!! You rock! Gorgeous!! I love this technique and am on the lookout for something to try it on. And you should be proud for “inventing” it. Bethany, your diningtable turned out absolutely gorgeous. You have an amazing talent for everything you do. In watching the tutorial, I actually am beginning to believe I might me able to replicate your technique on a smaller scale…something like your picture…lol! I enjoy flowers of any kind and would love to hang your picture on my wall. Thank you for the opportunity. I think it turned out beautiful! Just amazing! And so generous to share the how to. Thank you. I can’t wait to try this. So beautiful! I would be afraid to even attempt this and you make it look so easy. You are so creative. These are beautiful. You are so talented. These are beautiful. Your work is so beautiful!! I don’t think I have seen anyone else in blogland do what you do!! Gorgeous! The table turned out amazing!! In love! That’s a great color. Stunning! I have to give this a try! Thanks for the tutorial!! You are amazing!!! I love it!! Wow!! I love this technique!! Now I want to try this out!!! how absolutely gorgeous, i will say i was attached to the f.r.i.e.n.d.s looking version of the table, so cute! that’s a gorgeous makeover though, i’ve never seen anything like it! Amazing! I love that you kept her set and made it your own. Beautiful!! I love your work! Beautiful work Beth, I hope Grandma gets to see it! LOVE! LOVE!LOVE IT! I am going to do this! I too thought the chairs were pretty awesome before… But I am addicted to your staining techniques and this design is beautiful too! I have gotten so many compliments on the table top I did with your high-jacked idea! Keep ’em coming!!!! You have such a talent! What a beautiful piece! Pretty! I love staining wood! I love your projects. Keep them coming! You have such amazing talent and I’m so glad you decided to share this technique with us. It must be hard to know that the camera is running but you were great and so is your camera guy. I look forward to seeing more of your adventures and wish you the best in your parenthood quest. Rustoleum should be super proud of their product & being a part of your technique! Love it! Can’t wait to see you all this summer. I love this and hope I’m one day adventurous to try it myself!! Thank you guys! Also good luck in the baby world; my husband and I are struggling too which is how I found your site many moons ago!! Looks awesome! My daughter loves it! Wow! That was amazing to watch! I would hate to ever have to set that beautiful table!! My brain is buzzing with ideas on how I can utilize your staining as art technique! Wow! Beautiful! 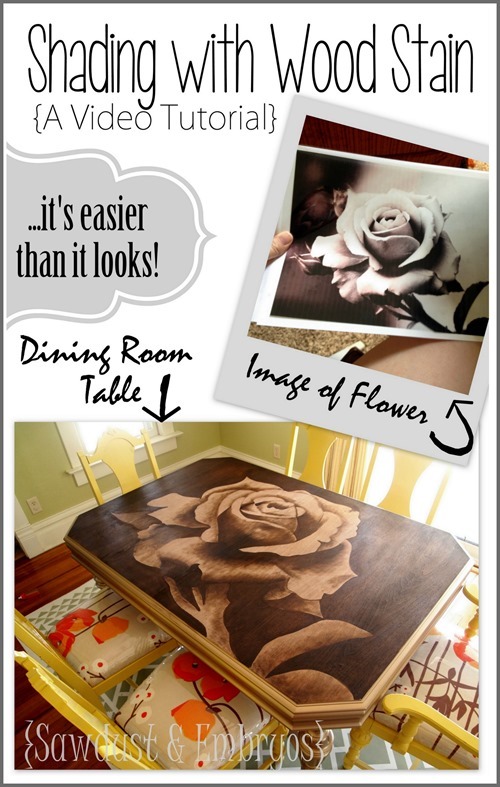 And a beautiful way to use your granny’s table and add your own style too. Love it! Enter me please! I love the table and the artwork! You did a great job! I would love to try this! I would love to try this technique on a little side table I have. What a beautiful table. Great job, you’re so talented! Your work is awesome!!!! Sharing!! I love this! 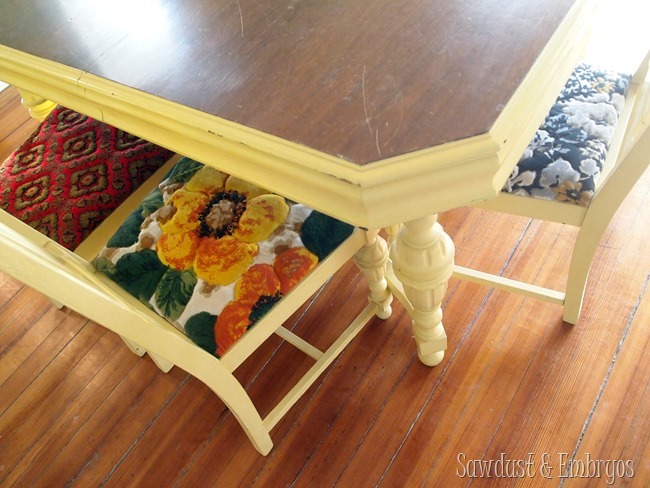 What a clever idea and I love how this is the perfect piece to sit around the table at! I do have a question ~ what did you seal this with? It probably needs to be super durable considering all the use a kitchen table gets! Keep up the awesome work you two! Love it! That’s a good question, I should update the post with that info. We used Rustoleum Spar Varnish oil-based with a satin finish. Lots and lots of coats for durability! This is SO Amazing! Wonderful job!!! Nice job on the table. You guys do amazing work! I’m envious of your talent. Pretty neat watching it in the video format! Looks great! You and your husband are supper talented. I enjoy your blog so much and would consider it an honor to own something that you created. It is beautiful! I still remember the first time I met you at the Iowa Blogger Event in IC – I had been pining over one of your buffets that you redid with my teacher friends, and there you were in the flesh! It was like I met my celebrity DIY crush! Keep up the great work, B! So neat! Gonna share with my super crafty mom. I have loved what have you done with this since the first project. I was just wondering if you have thought about ever trying a different drawing or image? I have been thinking of trying to do an Ultra sound picture of my son. Do you think it would work? I have not tried it yet bc I didn’t think it would be a good idea to deal with stain while pregnant. I also have hesitations bc my drawing skills are not that great. I also wanted to wish you the best of luck and that you will some day meet all of your embryos! Diane, that is SUCH a good idea. I would wear a respirator mask because of the fumes since you’re preggers. If you try this, pleeeeease send me pics! Wow! I absolutely love the end result. 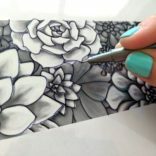 Some day I will try this technique, but I have to get caught up on all of my other half-done projects first! Love your blog! Love it! I’m glad the paint was more of a gold tone rather than silver. Huge fan of your projects!!! Awesome, innovative creativity & the video of the table reminded me of a graffiti artist working their skills on the street…just mesmerizing, bravo! You are an amazing artist!! I would love to win! Thank you for all the work you do on your blog. You are in my prayers as you go through everything to become parents again! Really beautiful! I think I am going to try to do a piece for my own home and then come up with some Christmas gift ideas using this technique. Your table turned out absolutely gorgeous!!!! You are an inspiration with your talent! Its gorgeous! I`d love to have such a lovely bit of pretty in my house. With 4 guys, pretty can be hard to come by! I love this table!!!! I have followed you for the past year and I am finally going to do my coffee table! I love your ideas and your blog! It’s gorgeous! You’re so talented! It would be such an honor to have one of your pieces in my house! Like getting a Dali or a Monet, before they are known throughout the world. I LOVE the table! Your grandmother would be proud! I have loved your stain work from when I first saw it. Thank you for the tutorial…it almost looks easy! Am looking forward to trying myself this summer. So gorgeous!! 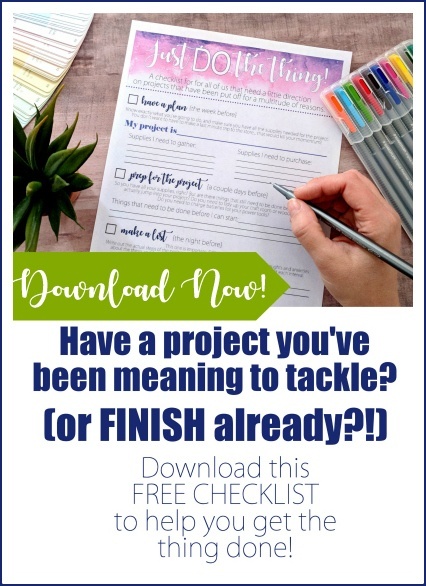 I always look forward to seeing the newest projects on your blog! Absolutely fabulous! 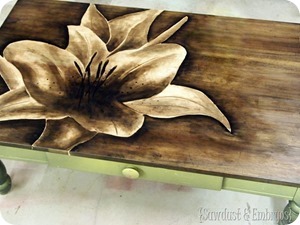 What a creative use of stain. That staining is so neat and I love that metallic color on the table! Love the makeover!…I HAD to post it on PINTEREST!!! I’m in awe, so gorgeous. I love your blog! The staining technique is awesome! Freaking awesome. Your talents are insane! I love the technique and want to know so thank you for the video. You are so talented. It really is a fun technique and the finished product looks great. I love your staining technique! 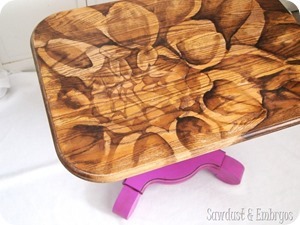 It’s such a pretty way to incorporate the stained look without being too boring! Amazing! Simply beautiful! Your art is gorgeous, your talent immeasurable! It reminds me of once when I took a watercolor class, using the same kind of techniques. Looks really awesome! I HAVE been on the fence about this technique in regards to my coffee table so im siper excited to see another example w a VIDEO!!! love love love it! 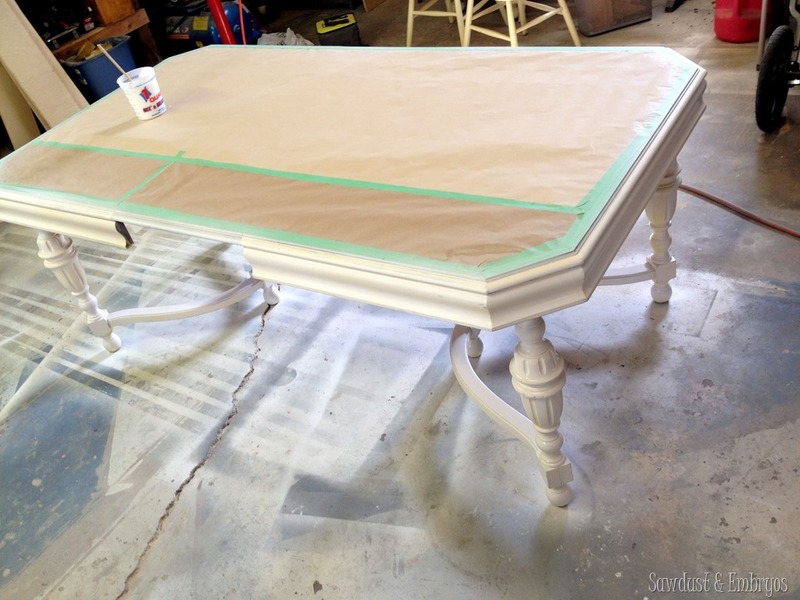 the paint color, the stain work… AMAZING! can’t wait to get into our own home later this year to start working on some fun projects i’ve seen you do. All these amazing projects and I’m sporting a broken (dominant) hand for summer! Darn it! Can’t wait to try this. Awesome! Love the video. And the table turned out absolutely gorgeous! Love that warm silver color! Nice work! I love this!!! I was just looking at the other ones you did a few weeks ago. Every coffee table I come across I wonder if it will be the one I try this on. You are very talented!! Thank you! Thank you! Thank you! Now I really understand how you did this. One of my summer projects was to try this. Now I’m ready to dive in. I love, love, love your grandmother’s table! Thanks for this inspiration! You are so creative! I love to see what you guys will come up with next. Thanks for sharing! I wish I had half as much talent as you guys. Love love as usual!! You guys are amazing and give me so much inspiration! 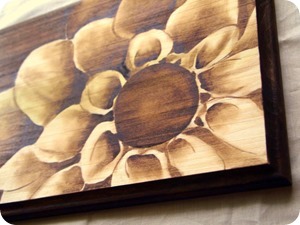 Would love to have one of your pieces of stained artwork in my home! This project is just breath taking. The beauty in it is unbelievable. Kudos to you for the talent! These tables are so beautiful! This is such a gorgeous idea! I love how creative and unique it is! You are so amazingly talented! I would love to see a dandelion for your daughters’ adorable room as artwork, I think it would be spectacular! Oh my, so awesome! You are so talented! You guys are so talented. Love it! Beautiful! 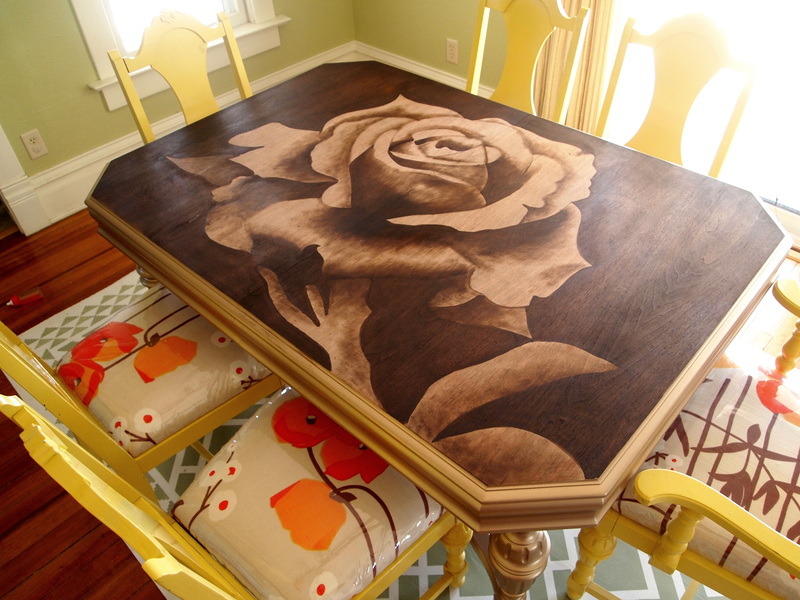 I always love what you do with furniture…such talent! Beautiful! You’re so artistic, Beth! I think this is my favorite staining project yet! So beautiful! We close on our first home in a month and I already have a list of projects based on what I’ve seen you two do. WOW!! Fantastic, a true work of art, from a true artist. So impressive! Also liked that you could sit on the floor! Old alert here. Such a fan of all your work. Your Grandma is proud!! Love this! Amazing. Thanks for sharing the video!! 🙂 Hope I win!!! Such talent! Beautiful work once again. Beautiful!! Loved how to table came out. Plus loved seeing the video. It was awesome to see u in action instead of just pictures! Absolutely beautiful table! I wish I had as much talent and creativity as you do. Thank you for sharing. We are dying to try this technique! You are so talented! I love reading your blog and drooling over all of your projects! So lovely and creative! Always inspired by how you guys transform ordinary things! Definitely an art form – except you can’t go back and “erase” quite as well as you can with a pencil … 🙂 Thanks for the giveaway! This is stunning! I really, really hope we can win the rose board- we’re in the final stages of an adoption of our gorgeous little girl Rose! I’d love to hang this in our home for her, when she gets here! Ever since you used this technique on the dresser I’ve been dying to try it out myself. Do you Have any ideas of images that would work well with this technique that doesn’t involve flowers? My husband isn’t such a fan of them but we both love the idea . I think you’re akin to a fairy. You work magic! LOVE THIS!!! That is such a beautiful table! I truly love all of your projects. You have such a creative approach to everything, and I am always looking to your blog for new ideas:) I love seeing what new ideas you come up with because they are so unique and fun. I am not as handy as you (I hope to learn to be!) but I am always directing my boyfriend to your blog to try new projects. Thank you for always sharing the process! This is absolutely lovely! Love all your projects! Wow these are just so attractive and eye catching! I love that you have chosen to do something new with an older piece. It updates the look without ruining the beauty of wood! Very unique and innovative! Please feel free to share or pin my posts! You're welcome to use ONE of my images (no collages or pinnables) with a link back to the corresponding post. Please do not edit or crop that single image in any way. Improper use of my photos, ideas or words is a violation of copyright. Thank you! Attention: Almost any do-it-yourself project involves risk of some sort. Your tools, materials, and skills will vary, as will the conditions at your project site. Reality Daydream has made every effort to be complete and accurate in the instructions of the plans on this website. Reality Daydream will not assume any responsibility or liability for damages or losses sustained or incurred in the course of your project or in the use of the item you create. Always follow the manufacturer's operating instructions in the use of tools, check and follow your local building codes, and observe all commonly accepted safety precautions.